Product Stewardship is taking shared responsibility for reducing the environmental, health and safety footprint of manufactured goods and materials across the life cycle of a product. Taking action on our environmental responsibility we are a signatory to the Australia PVC industry’s voluntary Product Stewardship Program developed by the Vinyl Council of Australia in conjunction with the Department of the Environment and Heritage. 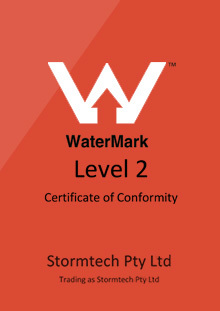 As a signatory, Stormtech embraces the voluntary commitments made under this initiative so as to address pertinent environmental issues associated with the manufacture, use and disposal of PVC products in Australia. To assist our customers in the disposal of unused PVC channel and fittings as well as stainless steel channel, fittings and grates we commit to receive these products or part of products, for recycling purposes.